Global HVAC Centrifugal Compressors Market size was worth over USD 900 million in 2016 and will surpass 670 thousand units by 2024. Rising energy security concerns along with improved refrigeration and air conditioning demand is driving HVAC centrifugal compressors market growth. Factors such as shifting consumer preferences for energy-efficient solutions with superior efficiency, service affordability and minimum running costs are expected to influence product demand. Increasing necessity for heating and cooling devices with low carbon emissions will further propel the HVAC centrifugal compressors market size. Government support to reduce energy waste, create customer savings, and promote the clean energy economy will trigger replacement demand. For instance, the European Union aims to reduce its greenhouse gas productions by at least 20%, thus achieving the energy savings of 20% or more by 2020. Financial support through subsidies on the purchase of heat pumps to encourage the use of renewable energy for cooling and heating applications will propel industry growth. Increasing commercialization of healthcare, education, airports, and retail facilities will further support the product demand. As per analysis, the global infrastructure investment is projected to surpass 90 trillion by 2040 and Asia Pacific is projected to dominate the overall market. 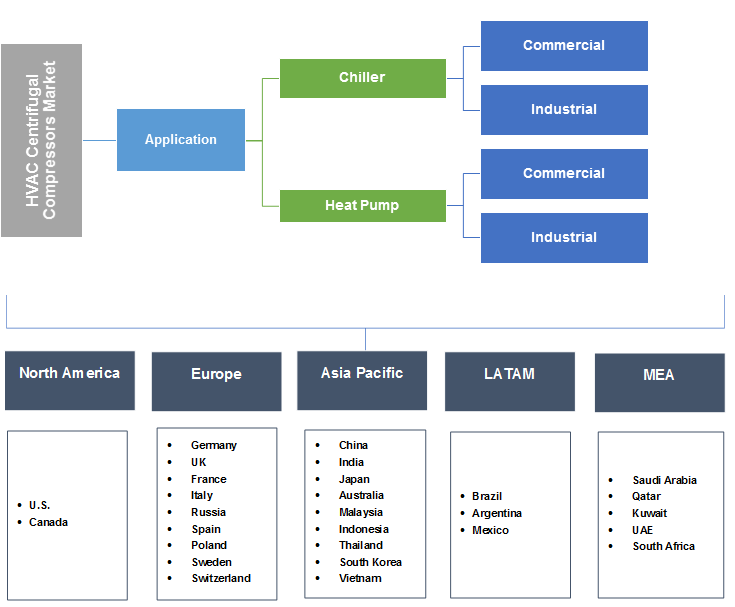 Increasing air conditioning demand in emerging countries including Brazil, China, India, and the Middle Eastern nations owing to large-scale infrastructure development and consumer base will provide lucrative business opportunities for industry expansion. Prevailing low fares are anticipated to flourish the global tourism & hospitality sector. The global hotel construction industry witnessed a robust growth in the recent years and the market stands at 12,190 projects in 2017. Key players in the global hotel construction pipeline are Marriott International with 2,239 projects, Hilton with 1,996 projects, InterContinental Hotels Group with 1,347, and Choice Hotels with 536 projects, providing a strong business outlook for HVAC centrifugal compressors market. On-going technological developments will positively influence overall industry trend. Replacement market is expected to be a key driver as the old unit undergoes retrofits, part replacements, overhaul, or complete substitution with enhanced technology. Increasing energy-efficiency requirements have resulted in improved R&D for the product development. In 2016, International Energy Agency (IEA) projected that energy consumption will increase at a faster rate for OECD countries owing to increasing infrastructural development. Patent accumulation and high commissioning cost may pose challenges for new entrants. Fluctuation in raw material prices such as aluminium, steel & titanium owing to fluctuating supply and demand may increase the overall production cost of HVAC centrifugal systems, thus influencing the manufacturer’s earnings and cash flow. Chillers are estimated to hold over 60% industry share in 2016. Globally, the expansion of commercial spaces, such as corporate offices and organized retail outlets, are likely to propel HVAC installations. Increasing demand for modern heating, ventilation, and air conditioning systems which offer better comfort, reliability, and cost-friendly solutions will provide a strong business outlook for manufactures. Regular energy audits in commercial and industrial sectors to regulate electricity consumptions is anticipated to trigger the replacement demand. Heat pumps are expected to witness CAGR over 2% up to 2024. Improved demand for industrial and commercial applications to reduce greenhouse gases supporting this segment growth. Key properties as accurate pressure control, pressure ratio, and better reliability fuelling centrifugal heat pump system application. These factors are expected to enhance the HVAC centrifugal compressors market size over the forecast time frame. North America HVAC centrifugal compressors accounted for over 15% industry share in 2016. Growing industrial sector is expected to fuel construction spending, which will propel regional energy requirements. Increasing necessity to reduce energy wastage and CO2 footprint driving adoption of energy efficient system. In addition, improved demand for centralized cooling systems for commercial spaces will boost the industry growth. MEA is expected to witness significant HVAC centrifugal compressors market growth over 2.5% the forecast period. Emerging economies including Saudi Arabia, Qatar, and Kuwait are set to witness a robust industrial growth. Favourable socio-economic conditions and government support to boost regional competitiveness will influence the overall market size. For instance, The Expo 2020-Dubai drives the high volume of constructional activities across the Emirates. As per the Expo 2020-Dubai Infrastructure Development, over USD 8 billion investment is allocated for infrastructure projects. 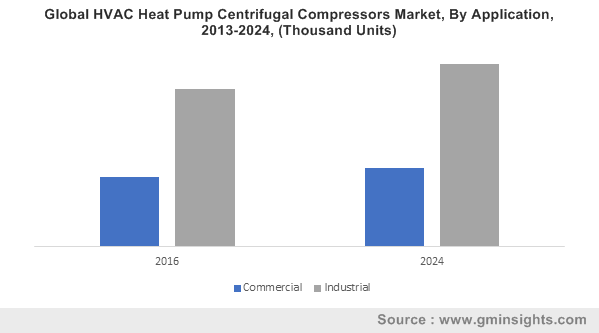 Some of the players in the HVAC centrifugal compressors market share include Atlas Copco, Hitachi, Danfoss, Mitsubishi Heavy Industries, and SKF. Rising electricity consumption and increasing demand for environmentally-sustainable processes will support the penetration of modern technologies. Other participants are Celeroton, Howden Group, Ingersoll Rand, GFA Compressors, and Elliott Group. Intense competition, surging energy expenses, and aggressive sustainability goals by government putting pressure on facility owners to accomplish greater productivity and industry standards. Major manufacturing companies are anticipated to invest in technological advancements & increase their R&D activities to gain a competitive advantage over the projected timeframe. For instance, Bharat Heavy Electricals Limited has a strategic alliance with GE Oil & Gas’ Italian entity, Nuovo Pignone, to manufacture higher size centrifugal systems by 2020. Centrifugal compressors are widely used for chillers and heat pumps in commercial and industrial applications. Several types of chillers are available in the industry based on the compressor type being used. Centrifugal water chillers are available in the range of 100 to 3,000 tons if prefabricated and can be up to 8,500 tons as built-up machines. Shifting preferences for cost-effective units due to the soaring electricity bills is driving the HVAC centrifugal systems market. Developed countries are setting goals to minimize the carbon footprint. The increasing customer spending is augmenting the construction of new shopping malls, cafes, sports facilities hospitals, and nursing homes. These buildings are likely to install centralized cooling systems and heat pumps for comfort and enhanced indoor quality.